When you create a new panel, it is added after the current panel.However, you can create a new panel before the current panel. You can also create a new panel that contains elements (layers) from another panel. In the Thumbnails view, select the panel after which you want to insert a new panel. In the Storyboard toolbar, click the New Panel button. 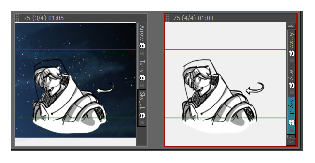 Select Storyboard > New > New Panel. A new panel is added to the storyboard and is part of the same scene as the current panel. In the Thumbnails view, select a panel. Select Storyboard > New > New Panel Before. A new panel is added before the selected panel and is inside the same scene. In the Thumbnails view, select the panel that contains the elements you want duplicate into the new panel. Select Storyboard > Smart Add Panel. In the Storyboard toolbar, click the Smart Add Panel button. The Smart Add Panel dialog box opens. Select the layers that contain elements you want to copy into the new panel. 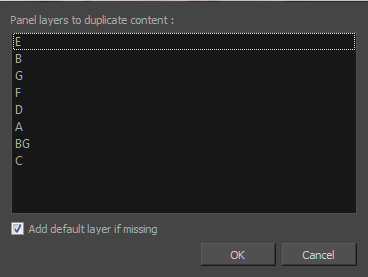 Select the Add default layer if missing option to create the default layers in the new panel if they are not part of the Smart Add Panel selection list. A new panel is created next to the selected panel. All layers are copied into the new panel, but only the layers you chose contain artwork.